I've also been trying to read up from everyone on how they can interpret and tweak the fuel map similar to the various threads on increasing the engine breaking parameters while running the EBR racing ECM. When I compare my original ECM XPR file vs the EBR racing ECM XPR (stock exhaust), they appear the same to me. 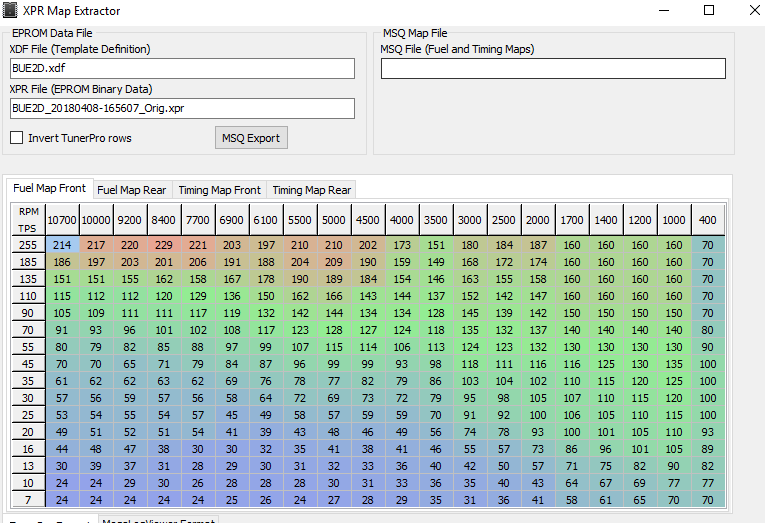 Additionally, when I use the Compare feature in TunerPro RT with the EBR XPR loaded, and the Compare with the Original XPR, it isn't showing anything different (comparing the Map 3D Fuel Front and Rear). But the bike behaves totally different front the stock ECM including the reduced engine braking...so I obviously need to continue researching this. From within ECMdroid i see numbers change between the original stock tune and the race tune i received. The engine braking is controlled by the idle rpm in gear with the clutch out which is higher than idle in neutral. The higher the rpm the less engine braking, it is like not closing the throttle all the way. Where this setting is though I do not know. Engine braking can be controlled by the amount of fuel is the last two rows. I would raise all the ones below 40 to at least 40. That is how we used to control it on the XB. Too much fuel will result in popping under decel. All that will do is make the bike run rich under those conditions, not alter the engine braking, that is the same as increasing the pilot jet in a carb bike, does not affect engine braking at all, the bike does not know clutch is out or bike is in gear. engine breaking on the 1125 is not controlled via fuel in the main fuel tables or the set idle rpm. There are specific tables that control engine breaking. These tables handle the IAC stepper motor as the main parameter to control engine breaking as this is the system that can override Your closed throttle by simply bypassing the air around the throttle blades. There are some parameters that can / need to be set right and from what I remember two tables (alternately selectable through a config byte) that deal with the IAC position at closed throttle deceleration. We had the same problem with our race bike as delivered from EBR back in the Pegasus Race Team days so I had to adjust it. Basically no engine breaking. Unfortunately it is too long ago for me to remember all the details but the IAC is the major player within engine breaking for sure. Thanks everyone for your inputs! I also double checked the IAC Setpoint table between the original file and EBR file and they are identical as well. So, I'm now assuming like Alex stated that there must be more to this than the fuel map and the AIC setpoint table....back to square one. Thank you for that information and if you ever recall how it is adjusted please post, this has come up a few times but never how to make the adjustment. You could come over from the UK to good old Germany and I could probably find out again what needs to be done . It is not too easy without a bike as I would probably have to test some things and I don´t have a 1125 here. Are You using the IDS software? This might be an option. I´m using the IDS software quite exclusively and if You can read out Your current data with the IDS I may take a look at it if You want and see if I can help You. I am confused. Are you saying that the IDS software is capable of changing stored data and settings on standard ECMs? There may be a definition problem here. What many folks call EBR race ECMs are standard ECMs with different maps. As opposed to the true race ECMs that were completely changeable by the IDS software. That is an eleven and a half hour journey each way Unfortunately I am using the Tunerpro RT software. I spent some time last night looking at this again and I will test a few settings and see if I can work it out. Thanks for the offer to look though. basically every Buell ECU is an IDS ECU - no matter if it is labeled standard or race - and the IDS software can work with all IDS ECUs. Still You need specific data and administration rights to make it happen . sounds like a real long journey, so You might be better off trying to play with the RT software. Best of luck. Here is what I am looking at the moment, the 2nd entry for load 11, 2200 rpm is what my bike does at clutch out with no throttle in first. Anybody tried adjusting these values? if not I will give it a go. The compare bin shown in the graph in red is the stock ecm setting. I don´t think You´re looking at the right table. This table defines the region where deceleration correction (probably fuel and maybe spark) will take place. If the engine is operated below the defined line (that is if load is less than the given number above each engine rpm) the engine is in deceleration mode and appropriate corrections are made (for example I see in the search window of RT in Your picture that there is a value called Deceleration Correction. My guess is it holds fuel correction values). 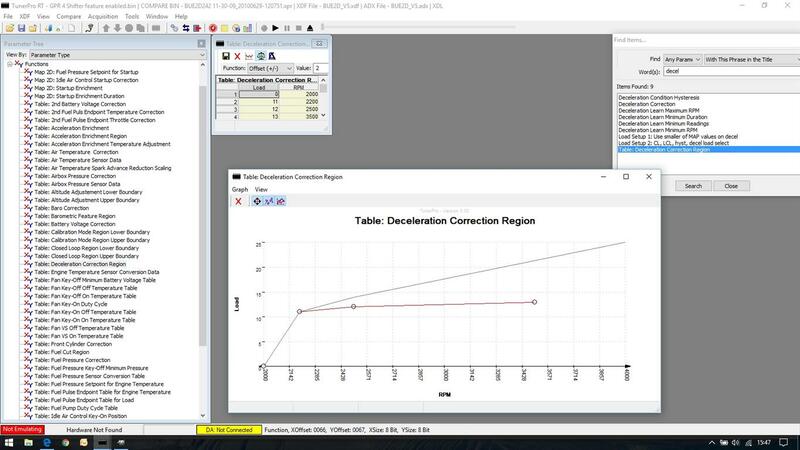 If You change numbers in the Deceleration Correction Region table all You do is alter the shape of the region where deceleration corrections are applied. 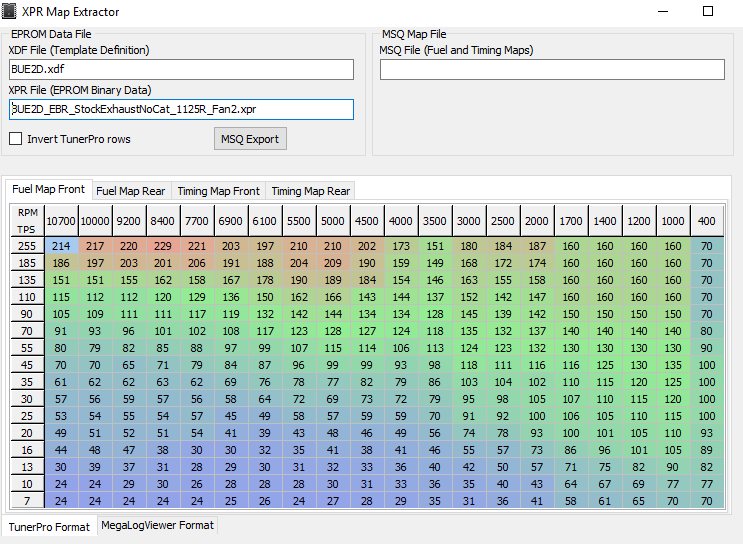 You could try to change values in the Deceleration Correction table to alter the effect that takes place within the deceleration region but I doubt that it will massively influence the engine breaking. As I said, the major player is IAC position during deceleration. I´m not sure if RT will show You the necessary tables at all as I don´t think that RT will give You all the tables and parameters that the IDS software can show. What Alex is saying is the issue is air not fuel. By reducing manifold vacuum, the engine deceleration force will be reduced and it is the IAC that passes that air. The amount of air that passes through the IAC is a product of a valve that is controlled by a stepper motor. The table Alex is referring to is the table that controls the pulse count that goes to the IAC stepper motor. Here you go and thanks for looking at this. The deceleration correction is just a %. 95 in the race ECM and 100 in the stock. I will give that a try as well. I have an EBR Barker tune with the stock engine braking. Would that be helpful to compare to the stock tune? meanwhile I looked in the RT software, too (I have looked at it some years ago and reloaded it now). I find pretty similar things compared to what You showed me. I played around with it and for me it looks like RT may mix up some things although I can´t say for sure. 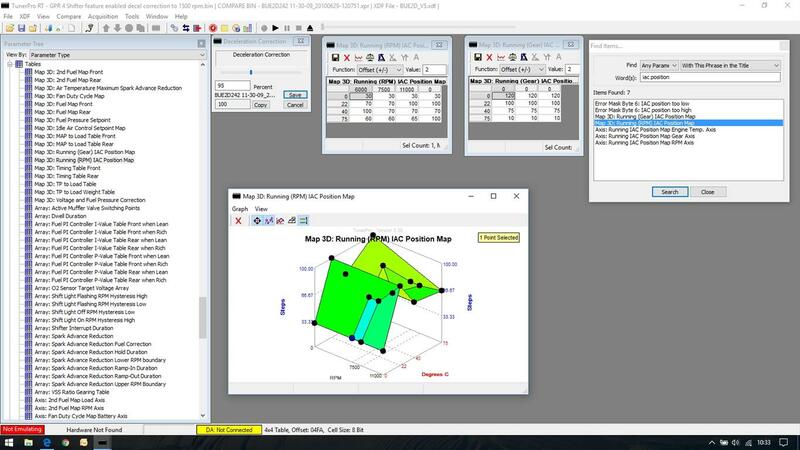 RT and IDS for example show some different behaviour when changing axis values and other things. So this is the point where I can´t help You any further as I don´t want You to have some unexpected results based on my advice. I hope You don´t mind. In the setup I used for our race bike the "Running (RPM) IAC Position Map" (which has a different name in IDS) was the one that I modified. It tells the IAC stepper motor which position to take based on rpm and engine temperature above idle. I do not mind at all, thank you for your help, I now have some options to try going forward. Thefleshrocket, I will get in touch if I need to look at that if that is OK.